Justin Sullivan/Staff/Getty Images News/Getty Images. Kale is a member of the cabbage (Brassica) family of vegetables. It is considered to be one of the most nutritious foods per calorie and has often been labeled a superfood. Although it can be eaten raw, it is more commonly steamed, sauteed, boiled, or massaged in lemon juice. There are many types of kale and, while most are green, there are also red and purple varieties. 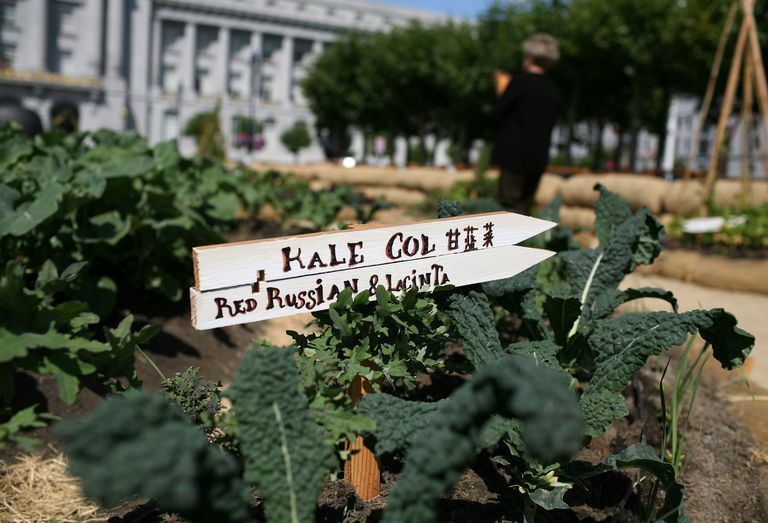 Some of the most common types of kale for consumption include curly kale, ornamental kale, and dinosaur (Tuscan) kale. Each variety differs in texture, taste, and appearance. Curly kale is usually deep green in color with ruffled leaves and has a pungent, bitter, peppery flavor. Ornamental kale often referred to as salad savoy, can be either green, white, or purple. It has a more mellow flavor. Dinosaur kale has a sweeter taste and a more delicate texture then curly kale and is often a blue-green color. Kale is a highly nutritious non-starchy vegetable that is low in calories and carbohydrate. One cup of cooked kale contains only 33 calories and 7 g of carbohydrate. One cup of raw kale contains only 8 calories and 1.4 g of carbohydrate. Most of the carbohydrate in kale is starch. There are no sugars in kale and there is one gram of fiber in a single serving of kale. The glycemic load of kale is estimated to be three, making it a low-glycemic food. There is no fat in kale. However, the way that you prepare this green superfood may change the nutrition it provides. If you cook kale in butter or oil or if you rub olive oil on kale leaves before roasting them or adding them to a salad, there will be additional fat. Kale provides about two grams of protein per one cup serving. Therefore, kale is not a high-protein food, but it provides more protein than some other comparable greens. Kale is an excellent source of vitamin K. One cup of chopped cooked kale has more than eight times the daily requirement. Vitamin K is important in bone health as well as clotting blood. If you are someone who takes a blood thinner, it is important to be consistent with your vitamin K intake. Kale is also packed with vitamin A, beta-carotene and other carotenoids, lutein, zeaxanthin. It also serves up 100 percent of the daily needs of vitamin C in one cup cooked. This makes kale a great vegetable to eat for eye health, immunity boosting, and anti-aging. Kale is a vegetarian source of calcium, making it a highly favorable vegetable in vegetarian and vegan meal plans. Kale is also a very good source of manganese, and a good source of vitamin B6, potassium, and copper. Kale is a green leafy vegetable that packs a huge nutrition punch. Comparable salad greens like romaine, iceberg lettuce and mesclun or spring mixes do not provide the same impressive nutritional benefits. For instance, in addition to the vitamins and minerals that kale provides, it is also an excellent source of fiber. Studies have shown that those people who eat high fiber diets (the daily requirements are 25-38g/day) tend to be at a healthier weight and have a reduced risk of heart disease and certain cancers. In addition, kale is one of the cruciferous vegetables, which have been shown to have anti-cancer properties. The experts at Harvard note that kale contains glucosinolates—compounds that are being researched for their potential ability to manage certain health conditions in humans including certain types of cancer and heart disease. Is frozen kale just as good as fresh? Fresh kale may be intimidating at times, because its' large, curly, fibrous leaves can trap dirt, making it challenging to clean and cut. If you are not used to making it, you may not know what to do with it. Instead, you can either purchase kale that has already been cleaned and cut (this is good to make kale chips or easy to use to saute or throw in soups, stews, or chili) or purchase frozen chopped kale. Many times, buying frozen vegetables is just as good, if not better, than buying fresh because the vegetables are picked at their peak freshness which makes them retain more vitamins and minerals. Which variety of kale is the healthiest? All kale is healthy, therefore it's hard to measure which type can be considered the healthiest. Each type contains a host of vitamins, minerals, and antioxidants. Purple varieties contain anthocyanins too, which have been linked with improving heart health. Note that some experts suggest steaming kale to maximize it's cholesterol-lowering effects because the fiber-related components in kale do a better job of binding together with bile acids in your digestive tract when they've been steamed. What is the best way to choose and store kale? Purchase kale, whole, frozen, or cleaned, chopped and packaged. Look for kale that is crisp, with a grayish-green color. Avoid kale that is wilted or limp. You can store kale in the coldest part of your refrigerator for a few days. To prevent wilting, place kale in a plastic bag first and close it loosely. If you are unable to use it in a few days, you can cook it—boil or steam, and place it back in the refrigerator cooked. Freeze it if you don't plan on using it for a while, it will keep in the freezer for about a month or two. To wash fresh kale, place it in a bowl of cold water. Empty the bowl and repeat until all the dirt is cleared from the leaves. Kale is typically available all year long with its peak season during the winter months. Kale has a bitter flavor and pairs well with rich, flavored meats, such as pork. It can be steamed, sauteed, boiled, or chopped and used raw in salads. For a healthy chip alternative, try baking kale leaves to turn them into crispy kale chips. You can also use kale in soups, stews, egg dishes, and chili. It has a great way of enhancing the flavor of your meals and serves as a hearty, and healthy addition to your meal plan. Kale allergies are rare. According to the Natural Medicines Database, kale is likely safe when consumed as a food, and possibly safe if used medicinally. The source also notes that it is not known if this product interacts with any medicines. Labensky, SR, Hause, AM. On Cooking: A textbook of Culinary Fundamentals. 3rd ed. Upper Sadle River, NJ: Prentice Hall, 2003: 618.